In working with my new gardening client Anne, one of the first modules I organized in our coaching sessions was "Mastering Your Marketing Plan." Anne's side business of gardening tips makes a great case study, in the sense that she already had a lot of content and tools developed, yet she is still frustrated and feels like she is going around in circles. While Anne has some projects in mind such as publishing books and doing more speaking, in my coaching I have brought to her attention that her website is not where it needs to be in terms of attracting leads and engaging visitors, and making it clear how to hire her, for example. I was also concerned that the book project would overwhelm her, and some of the more foundational aspects of her business, like a mission statement, tagline, social media strategy, and market research, has not yet been thought through. The thought of a written marketing plan hadn't occurred to Anne, but it was one of the first suggestions I made to her when we agreed to work together. It may sound cliche, but there are so many small business owners who start launching websites, books, videos, social media profiles, and newsletters, without the slightest idea who their target customer is. Isn't that like cooking a ten-course meal without any udea who is going to be eating it? 2. specific criteria for making decisions on new projects so as to avoid "overwhelm"
3. parameters for money and finances. For example, how much do I want to make a year, or a week, or a month? How should I price my products? What can I afford to spend on marketing? The first draft of the plan template was several pages, but Anne told me she needed something more simplified and compact, so here is the one-pager I came up with. Anne is passionate about gardening and her business, which is the foundation of any entrepreneurial endeavor. I'm so excited for her, and I think in the next few months her business is really going to blossom! What say you? 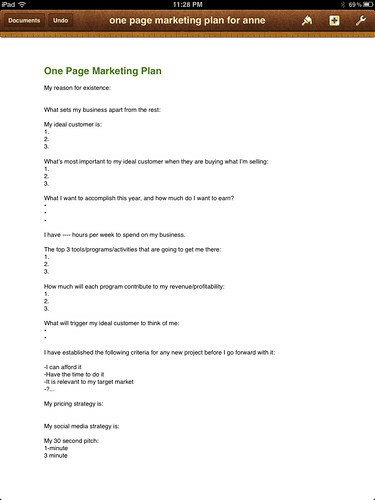 Have you tried a marketing plan for your business? What have been your challenges and triumphs? Comment here, and feel free to use this one-pager to jump start your biz!